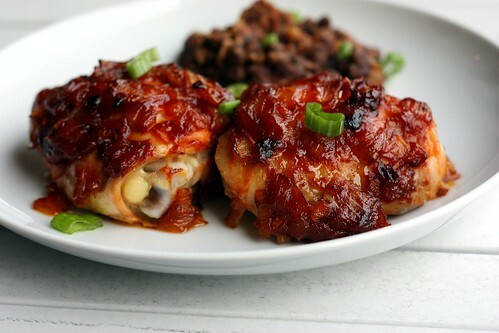 Caramelized Chipotle Chicken – Elly Says Opa! Like I said last time (and many, many times) I love chipotles in adobo. With the spiciness and the smokiness, you really can’t go wrong. As soon as I saw this recipe pop up in my google reader, I starred it. I could tell just from the recipe that we would love this, but the fact that Josie from Pink Parsley made it and liked it sealed the deal—we tend to have very similar tastes in food. This is essentially a roasted chicken dish with chipotle barbecue sauce. The sauce is spicy from the chipotles and slightly sweet from the brown sugar and ketchup. The cinnamon is almost undetectable, but just that little bit does give the sauce a little extra something. . In fact, I think a little pinch of cardamom would be great in here, too. I decided to make this with chicken thighs, which worked out perfectly. Roasting 2 entire chickens for the two of us sounded like a bit of overkill. This is actually the second time I’ve made this chicken, the first time being with leg quarters. I love dark meat, as you know. The first time I made this, though, I neglected to realize the flash was on my camera, and it just looked like a giant scary orangey-yellow mass. I didn’t think it would make you want to make it. Hopefully this somewhat better picture will sway you. Heat oil in a large heavy skillet over medium heat, until shimmery. Cook garlic, stirring occasionally, until golden, and then remove with a slotted spoon and set aside. Add the onions to the oil, and cook, stirring occasionally until golden brown, about 15 minutes. Add garlic and remaining ingredients, except chicken, to skillet and simmer, stirring occasionally, until thickened, about 25 minutes. Preheat oven to 450 and place a rack in the center. Brush half of the sauce over the chicken thighs and roast skin side up for 15-20 minutes. Brush remaining sauce on chicken and roast until cooked through and well browned in spots, about 20 more minutes.